Because other team was already in Puurs, i took a plane and joined them on thursday. 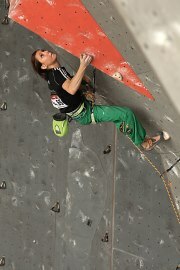 Competition in Puurs is always very good organized and said with one word, perfect! On the day of competition, standing under this wall brigs me mixed feelings. I was happy to be there, excited to go climb, observed the routes and liked them, but honesty, also kind of unsure what to expect ... And this kind was also my climbing - little too 'secured'. But already in first route, which i have topped out, i got a prove, that everything is almost where it needs to be :). So, go on! :) Next day there was ½ finals and finals. In ½ final i started very good, but later in upper part of route little 'stuck' on some few places and spent some extra power to come trough. But, it was enough for finals :). Route in final was by my opinion easier than ½ final, maybe with some more cruxy parts and top (but i can't say for sure, because i didn't come till there). Well, maybe to sum up that day – i was happy to be 'back' again, not loose too much in this time and satisfied with climbing - specially, that i fight and not give up! So, after competition we packed thing and went back to Slovenia for few days, before leaving on next step on WC's in Atlanta.